Layering isn't just for the winter time. Try using a large piece of seagrass/sisal and then place an antique or reproduction rug on top. This look adds both texture and color to a floor. This is a great way to unify one large space. It is also an ideal way to show off a beautiful antique rug that would otherwise look to small for the room. 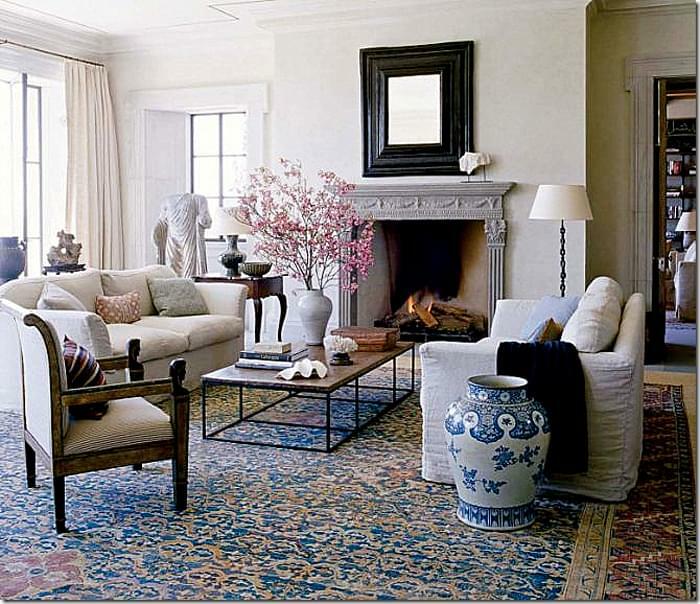 Michael Smith layers a beautiful antique Persian rug over a large piece of seagrass. Notice how the rug is the only pattern in the room. In the living room of a Hudson Valley town home, designer Peter Frank uses a small antique Oushak on top of seagrass. The rug alone would look too small in the room. This photo is from the October issue of House Beautiful. Here, designer Mary McDonald opts for Tabriz over seagrass in a dining room. Photo from the October 2010 Veranda. Design duo Dana Abbott and Kim Fiscus layer in a bedroom. Again the rug is the only pattern in the room. Flat weaves can be layered over seagrass too! This is a great way to create a casual and fun room.